This coming August my husband and I will celebrate our 13th year anniversary. It’s pretty crazy to think we were married that long ago. If there is one dessert that reminds me of our wedding day, it’s chocolate covered strawberries. 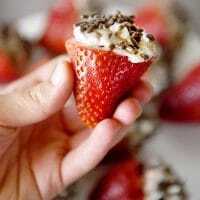 I still remember my mom telling me that she never wanted to dip another strawberry in chocolate after that day because we had SO many to make. It was all worth it in the end because they were the thing everyone loved! 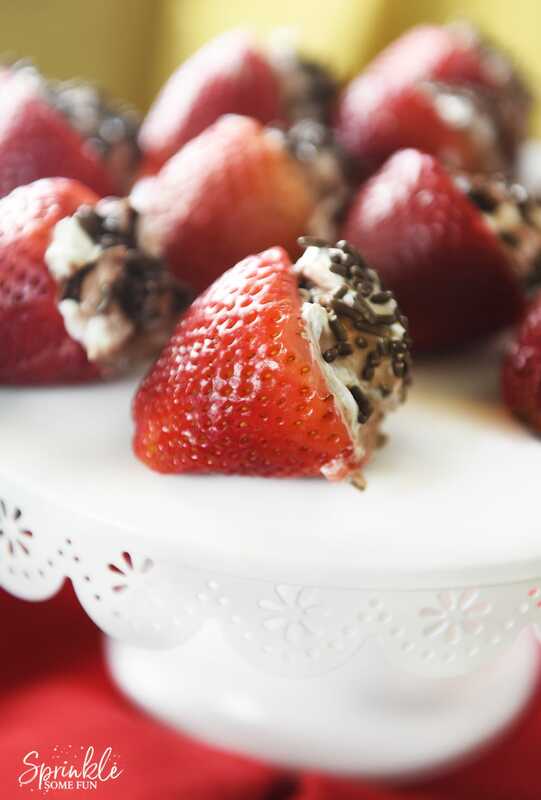 Chocolate and strawberries just belong together and these Chocolate Crème Pie Stuffed Strawberries are a perfect chocolate strawberry duo. Plus, they are super easy to make with only 2 ingredients! 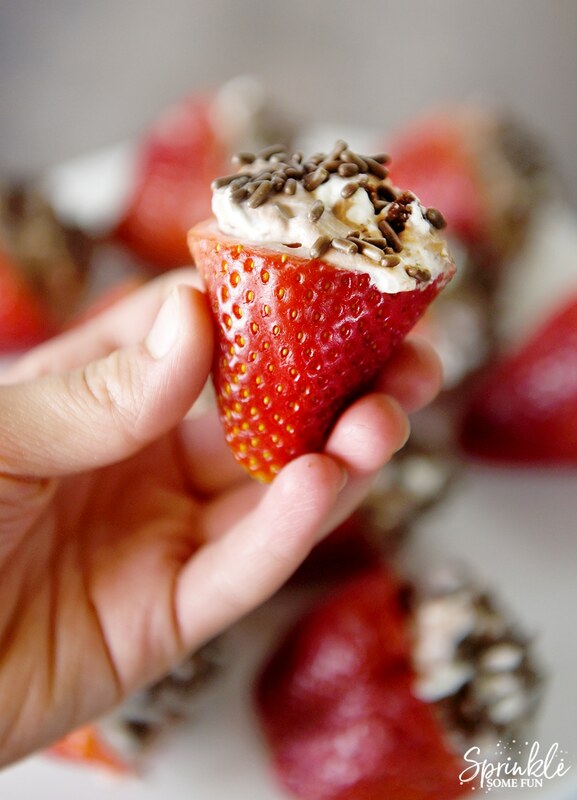 Chocolate Crème Pie Stuffed Strawberries are filled with a delicious Edwards Hershey Crème Pie and then sprinkled. 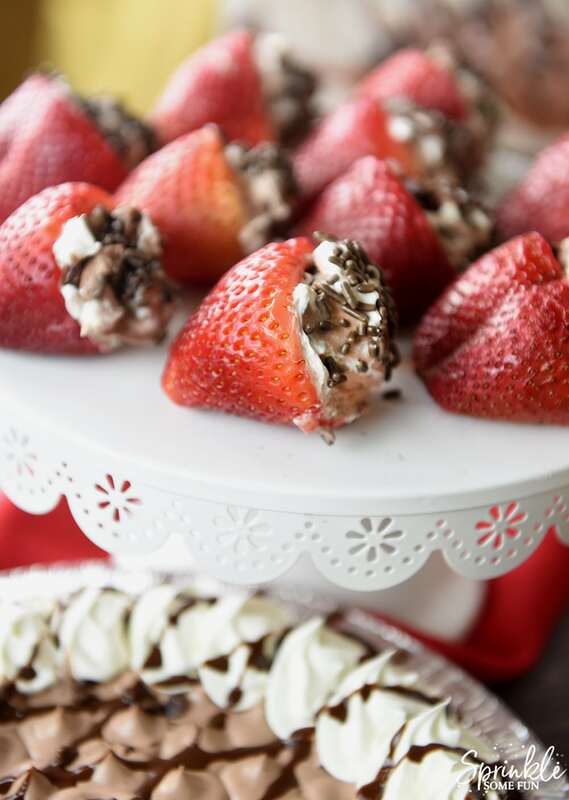 If you like chocolate covered strawberries… then you will LOVE these! I love to keep a couple of Edwards pies in the freezer to keep around for when I need them. Edwards pies are perfect for ANY occasion whether you are celebrating a birthday, work event, graduation or retirement. Our whole family loves them and they have so many to choose from. Edwards® pies are fresh and have a delicious cookie crumb crust. Each dessert is filled with velvety layers of sweet cream and dusted with decadent toppings. YUM! 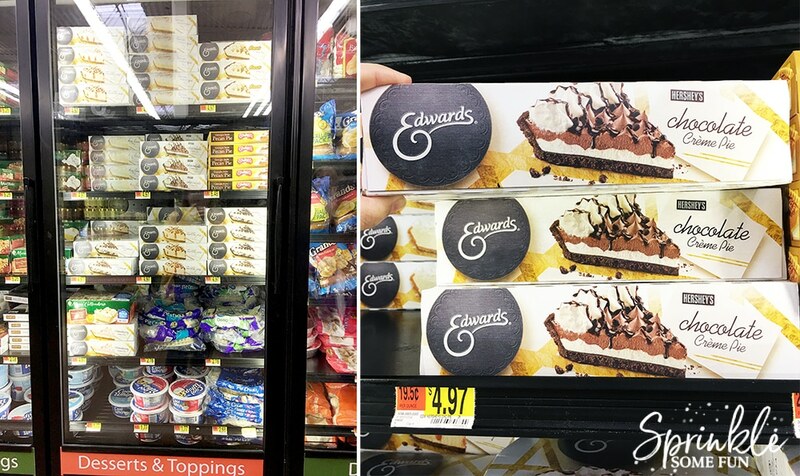 I found the Edwards Hershey Crème Pie and Edwards Edwards Turtle Crème Pie in the freezer aisle at Walmart. The hardest part is choosing which ones to buy, but on this shopping trip I was thinking chocolate! I am so glad I did because the Edwards Hershey Crème Pie was the perfect pie to stuff inside the strawberries. These are literally as easy as pie to make! Just hollow out the strawberries with a melon baller from the top of the strawberries. 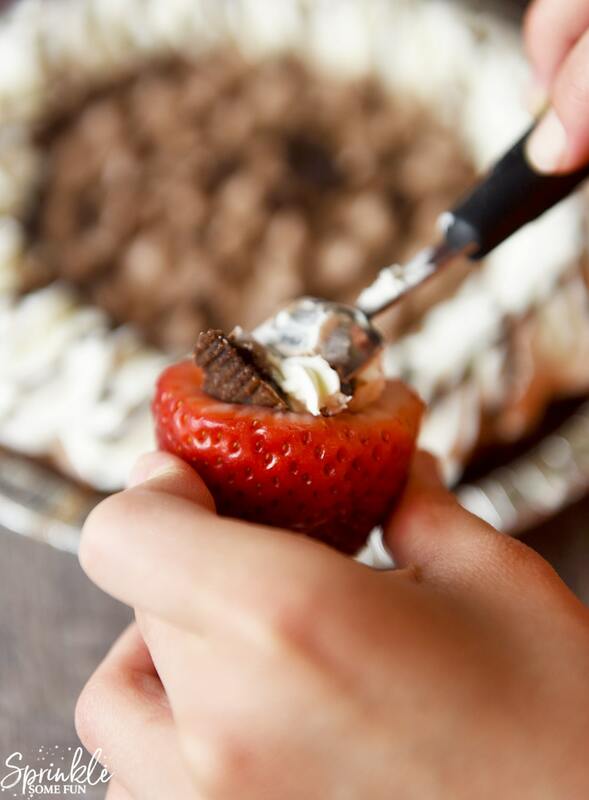 Then scoop a little of the pie on a spoon and stuff the strawberries with the pie. Then add a few sprinkles and you are done! We loved that the Edwards Hershey Crème Pie had a chocolate cookie crust. It was sooo good and all that cream was amazing! Then the sprinkles just added a fun touch to bring it all together. Cut the leaves off of the strawberries and then use a melon baller to scoop out a hole in the middle from the tops of the strawberries. 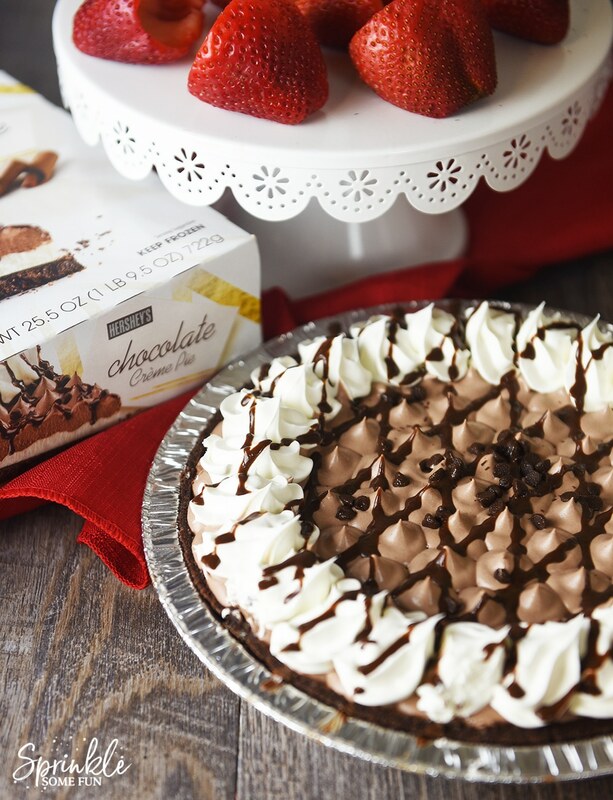 Fill the holes with the Edwards Hershey's Crème Pie. Add sprinkles as desired. Serve immediately or set in fridge for a few hours. 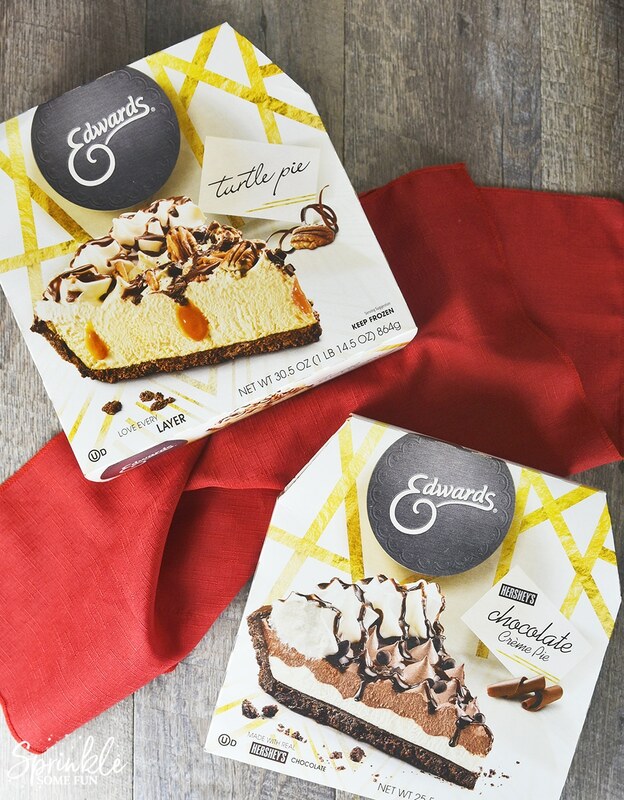 What is your favorite kind of Edwards pie? Be sure to check out their new packaging which features the pies we know and love.